So it's been a while, what with all the holidays coming around. Nonetheless, I think I am done with the teeth (I hope!). https://imgur.com/a/kcBow If my teeth are indeed done, next thing I'll be looking at is the back of the dome to find out if it still needs that extra bit of trimming before putting the helmet together. So I got to work on the teeth some more, and worked on making the holes more square shaped. https://imgur.com/a/VrH19 It still needs some cleaning up, but I think it is looking better. So I coincidentally was looking into buying my own boots today, and found the same boots in my search. I was able to find some at my Kohl's, and got some at a great price. https://imgur.com/AUlPmFD So the big thing that I notice is that the front pull loop is missing. I'm sure there is a way to add one, but I am definitely far from experienced. In fact, I just started trimming my first kit, so I could be missing some pretty glaring issues. If there isn't a way to add the loop on the front, if a more experienced trooper could tell me so I can return these before going all out modifying these. So here's the dome. Now, for this next picture of the dome I am a bit confused if I am supposed to trim the straight parts after the curve ends. I think I am supposed to, but I am not positive. It looks like the build I am following does so, but he hardly seems to take a good picture of the back for me to be quite certain. And finally, the faceplate itself. I know the teeth aren't done yet, but I was wondering if I was taking off enough material or not for it. The best example of what I think looks done is the first tooth's right gap. Hello all, recently I have gotten my ATA kit. This is my first build with Stormtrooper armor, so advice would be very much appreciated! So far I have started on my helmet, and I have been following pandatrooper's build thread. I will try and post a lot more photos in future posts, but as of now despite resizing I can't seem to be able to attach any files. Guess that's what I get for being a newbie on the forums. 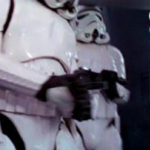 Quick question: Looking into the armor kits, I am under the assumption that "ANH Derived" means that they are using the original molds from ANH's production. Would this be correct, or am I mistaken? I'm continuing to look into ATA, but cannot find a specific price. Is this because it varies per customer needs? The southern part of North Carolina, if that helps locate me any better. 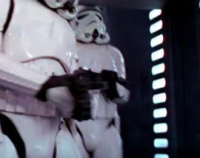 I am looking into the ATA, and I believe I am aiming for that, but as we all know, Stormtrooper's aims aren't always the best, so I may choose otherwise depending on how the other kits appeal to me. I have read that, but thanks regardless. I would be located within the Carolina Garrison if I were to join up. I have been trying to look for an armor party, even if I don't have any armor, just to see how to handle the armor.